The continuation of the Godfather saga with two focuses: the ongoing story of the Corleone family, and Michael in particular, and Vito Corleone’s (Michael’s father) backstory. Regarding the ongoing Michael Corleone story, it is about seven years since the events that concluded The Godfather. 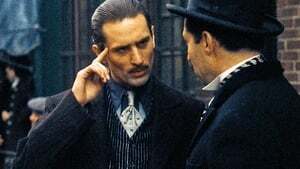 With the murders of the heads of the other four New York / New Jersey families, the Corleone family has unassailable control in New York. The move to Nevada went smoothly and Michael Corleone controls several hotels and casinos in the state. Frank Pentageli, the man who runs Michael’s interests in New York, comes to Michael, asking if he can take out the Rosato Brothers as they are infringing on Pentageli’s turf and business interests. However, the Rosatos are backed by Hyman Roth, a business partner of Michael’s and a long- time ally of Michael’s father, Vito Corleone, and Michael refuses. An attempted assassination attempt is then carried out on Michael’s life, in his own home. Michael investigates who is trying to kill him, and suspects that there is a traitor in his family. Meanwhile. Michael and Hyman Roth fly to Cuba to finalise some business deals there. The Cuban trip reveals all. In a story interwoven with the present day, we see the backstory to Vito Corleone. From how his parents and brother were murdered by a Don in their home town of Corleone in Sicily, to his escaping, as a boy, to New York, his adult life and his rise to Don Corleone.